So I have a lot of feelings about Obsidio. Just to recap, I loved Illuminae and thought Gemina was just okay. And now here we are with book three... I think my main takeaway from Obsidio is that this series has a very limited supply of tricks up its sleeve, which it used up in book one, leaving books two and three to pretty much be rehashes. 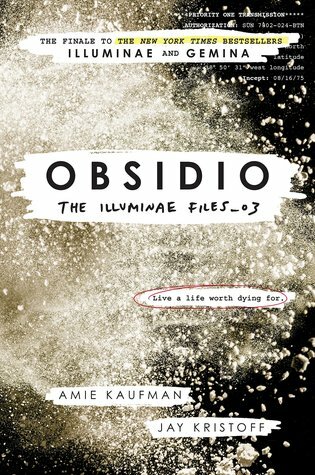 Obsidio, like Gemina, picks up with two new characters, Asha and Rhys. Honestly, it's been so long since I've read Illuminae that I can't remember how much I liked Kady and Ezra, but I can definitely say that I enjoyed Asha and Rhys more than Hanna and Nik. I actually wish MORE of the book had been devoted to them, because their story was infinitely more interesting than that of the older characters, in my opinion. I loved that they already had backstory, meaning no instalove! I found them both to be compelling characters with understandable motives and moral struggles. I enjoyed watching the people on Kerenza interact with each other and struggle through each day... and that's about where my enjoyment ends. From here on out, this might be a little ranty and a lot spoilery. I am so upset with this book and the series as a whole! The rest of this review will outline my issues with Obsidio and will be in bullet points, which I know is different from the rest of my reviews, but it's the best way I can think of to do it without going off on twelve tangents. Shall we begin? One of my biggest problems with this series is with the humor. Specifically, every single character has the same sense of humor AND they all use their annoyingly similar sense of humor literally all the time. At the most unnecessary times. Literally a life or death situation and these morons are bantering back and forth making jokes. Sure, it's fun to read, but it's not at all realistic and it got old quickly after book one (for me). Which brings me to my second problem: the way the military is portrayed. Let me get something out of the way - I am not a gung-ho patriotic person by any stretch of the imagination. I don't even own a flag. That being said, I did do four years in the Air Force, so I have military background. Yeah, there were times in those four years when I said or did unprofessional things around my supervisor or officers. But... you better believe I was reprimanded for it. Maybe so far in the future things will be super relaxed and people will be able to talk to their superiors with 100% sarcasm, cursing, and unprofessionalism. But unless something drastic happens between now and then, I can't imagine military personnel behaving the way they do in this series. Like I said, this isn't a "I love the military" thing, because I don't. It's just a "My god that's unrealistic" thing. And continuing the unrealistic relationships train of thought, I cannot buy the Kady/AIDAN relationship. While I can accept that Kady does become attached to AIDAN, he is not a HE. He is an it, which they discuss a tiny bit in this book. But towards the end of the book I had a very hard time suspending disbelief any further. There's a point at the end when AIDAN inserts himself into an enemy ship and decides to sacrifice "himself" for the good of the fleet. AND KADY TRIES TO TALK HIM OUT OF IT! Instead, she wants to sacrifice herself and everyone else on her ship. Instead of AIDAN. Who is not a person. Who is a computer program. I'm sorry, what? This is where they lost me. Venturing further into spoiler territory, let's talk about FAKE DEATHS. Remember when I mentioned that this series used all its tricks in the first book? This is what I'm talking about. There was a fake death in Illuminae and that one got me! I was totally taken off guard. But then the exact same thing happened in Gemina and I wasn't fooled. I felt nothing when the death happened because I was sure it wasn't going to stick. Then we have Obsidio... When I started, I even texted a friend and asked if there was a fake death. Well, let me tell you, friends! Obsidio has not one, not two, but THREE fake deaths! It's completely ridiculous. Welcome to my next point in which I expand upon the ridiculousness of the fake deaths. My problem with them in Gemina and Obsidio? They're predictable. Just like every single other big twist in this book. When Asha was arrested by Rhys and Co. I knew it was going to be a big twist and that he hadn't actually betrayed her. I knew because this series is so freaking predictable that I. Can't. Even. Which brings me to my last point: everything is so damn predictable that I was never for a single second worried about any of the main characters. At all. Because I knew they would all live. And guess who was right! Yep, all six of the main characters - all three of the main couples - lived. In this series about constant battle with literally thousands of deaths, the six main people who are at the center of every single major battle live. In fact, pretty much every single character that gets more than a few sentences of page time lives. Look guys, I don't need George R.R. Martin level killing sprees, but I do need some kind of realism in my books and this is just dumb. So here we are at the end of a series that started on a really high note. A series I was SO excited for, but that has been a massive disappointment. I'm not sure why it is that the authors decided to make each book so similar to the others and I have no idea why all the characters are almost carbon copies of each other. I know I'm in the minority on this one, but there were just very few redeeming qualities in Obsidio for me.